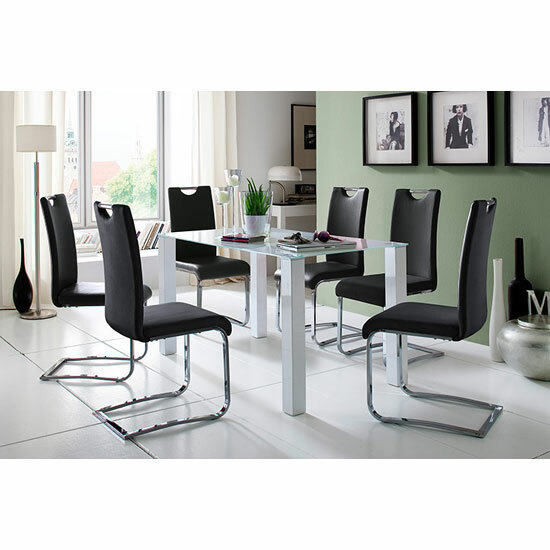 If you are looking for a set that is not only memorable and impressive, but also easy to maintain, nothing will suit you better than a sleek combination of black tempered glass table and a set of contrasting white leather chairs. This rich and luxurious combination is perfect for all sorts of interior settings — both leather and glass work fine in traditional and modern rooms, while the classic, timeless blend of black and white will unlikely go out of style. Another impressive chair type that will look amazing with a tempered glass table — no matter, if it is clear or tined one, is a high gloss chair. This shiny slick finish is a perfect match to shiny glass table surface. This amazing combination is perfect for modern dining rooms — one of the truly best examples that will shock your guests and leave a lasting memorable impression on anyone you welcome into your home. One of the best — even though, rather pricy examples of outstanding dining sets that will shock your guests — are sets made of manually processed genuine wood. The thing that makes these models so special is that no separate wood piece is identical — even if taken from the same tree. Each table and a set of chairs will have shade and structure of its own, bringing timeless elegance into your dining area. Yet another expensive example on outstanding dining sets that are made to impress are stone and marble sets. Whether you go with a marble base, top, or both — each option is a one of a kind example that will give your home a luxurious, rich look. Another idea on wooden sets would be to go with French style — even despite their vintage designs, these outstanding sets still look time relevant in neutral traditional interiors. Neutral, white colour, the warm look of genuine wood and modest, but flirty carving — those are the primary things that make French style furniture so special. Another idea would be to go with an in wrought metal base, giving your dining area a touch of old fashioned bistro charm. Finally, if you think that these awesome sets are not for you simply because the space you have to work with is small, take a look at this quick guide — it will teach you a couple of useful tricks on how to find amazing dining sets even for the smallest of dining rooms and kitchens.